All the details are cut and it’s time for the final sanding before applying finish. This is a really large surface to sand, so I pop on my earmuffs and get started because it’s just over an hour per grit! Ready to use these Festool 6″ Sanding Discs on the table! 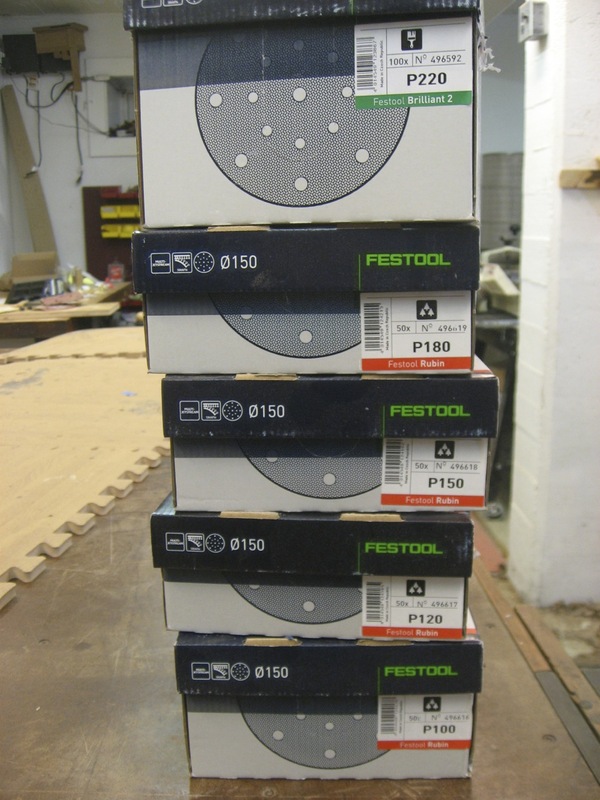 My tools of choice are a new Festool 6″ ETS 150/3 hooked up my Festool CT 36 Dust Collector. It’s a great combination. 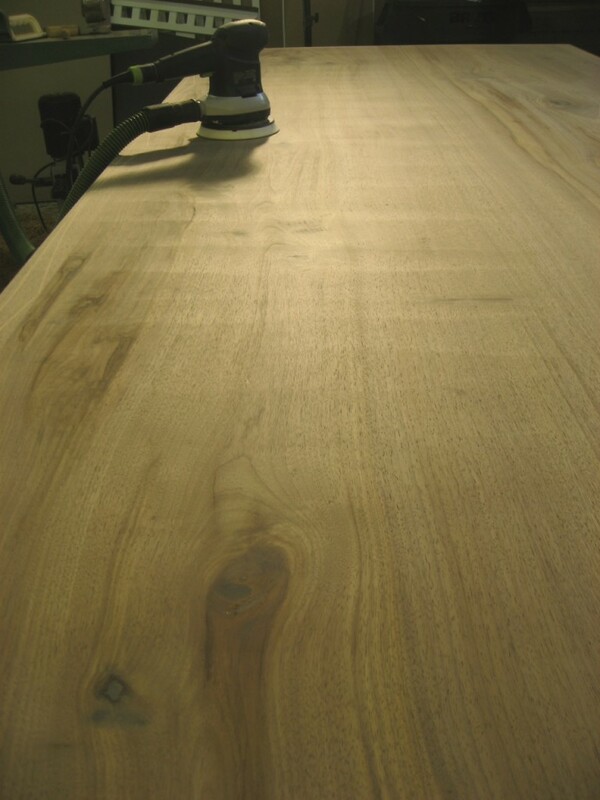 I added the 6″ sander to my collection because it has 44% more surface are (than the 5″) and this is one large table! I go slowly back and forth across the grain first – about 1′ every 10 seconds, overlapping each stroke about 1/3. I then go with the grain, end to end with the same motion. I use maybe 3-4 sanding discs per grit. You can see that when I go across the grain, the sander does leave stroke marks (pic below). This happened with all grits actually. You can’t see it once I went with the grain. Note the cross-grain pattern moving the sander in that direction. 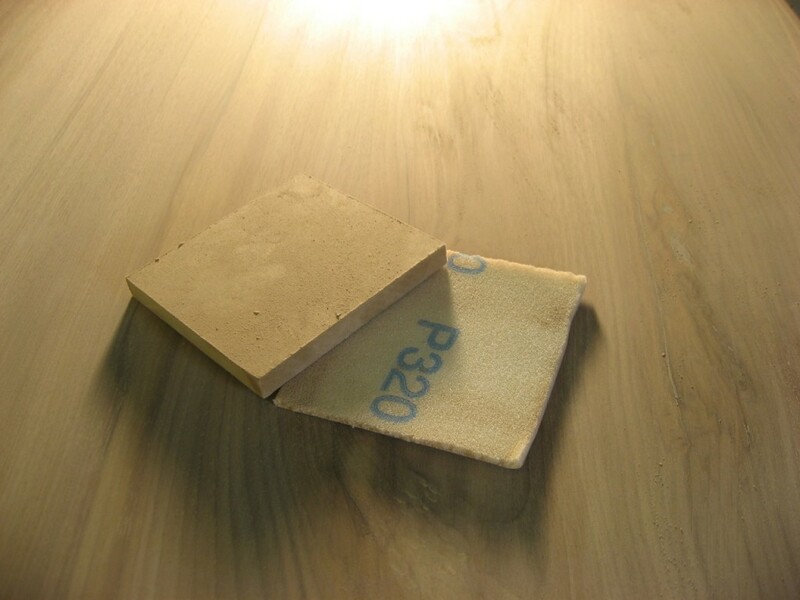 After using the 220 paper, I switch to hand-sanding. I made a small MDF block the same size as the new Festool Granat Handsanding Pads. I ran this over the table with the grain. I used 320 and then did a quick scuffing with a 400 also. Whew, OK. Time for finish! Oh, and I did all that only on the top. The underside just got some scuffing where I wanted to smooth it, no more than 120 grit by hand. Just enough to make it smooth to the touch. The Chairman: Windsor Chair by Hand We’re on Pinterest, are you?